Simon Evan-Cook, Senior Investment Manager, Premier Multi-Asset Team, Premier Asset Management, discusses the fund's primary objectives and performance, key drivers to the return, opportunities and threats in current market conditions and where the fund could fit in a client's portfolio. MIKE HAMMOND: Hello, and welcome to this fund update on the Premier Multi- Asset Global Growth Fund. My name’s Mike Hammond, Sales Director at Premier Asset Management. And I’m joined today by Simon Evan-Cook, Senior Investment Manager and a member of the multi-asset team. Hello Simon. MIKE HAMMOND: Simon, it’s probably worth started just by reiterating what the primary objectives of the fund, and how the multi-asset team look to achieve this. SIMON EVAN-COOK: Well like all of our funds it has a very specific outcome it’s looking to achieve for investors who hopefully need that particular outcome. With this fund it is as the name suggests growth. It’s a long-term savings vehicle. It’s looking to achieve high total returns over the long term, and to do that in a way that’s not too volatile so it doesn’t make holding it too uncomfortable. How we look to achieve that. As with again with all of our funds is we use a valuation approach. What we’re looking to do is position the fund in areas where there is attractive value, which tends to go hand in hand with higher long-term returns. And again it’s a multi-asset multimanager approach. So we can use different asset classes. We’re predominantly equities given the high growth mandate for this particular fund. But we can use other asset classes when we think they can achieve that. And we are multimanager so we’re looking to use the very best of the active manager talent that’s available to us to actually achieve those returns. MIKE HAMMOND: So the multi-asset team has been managing the fund for five years, and obviously as you just highlighted the objective is to deliver long-term capital growth for the clients. So how has the fund performed since you took over the management of the fund in 2012? SIMON EVAN-COOK: We’re very pleased with how it’s performed. It’s continually outperformed the sector. It’s in the IA flexible sector. It’s done so by a reasonably large amount, and it’s done so importantly on quite a consistent basis as well. So that performance hasn’t just come from one big year, it’s come from nice solid returns on a year in year out basis, which is again I think important for investors in that fund that level of consistency. MIKE HAMMOND: So as well as the long-term capital growth, you also talked about trying to deliver equity like returns without the volatility. So how has it done from a volatility perspective? SIMON EVAN-COOK: Well broadly speaking over the time we’ve been managing it it’s been, it’s matched global equity markets after charges have been paid, so that’s a tick in that box. But crucially it has done so with lower volatility. So it has been a smoother ride than if you’d just bought the global equity index in tracker form. So it has achieved on both sides of that. The total returns have certainly matched up to that, as has the lower volatility too. MIKE HAMMOND: And if you look at the performance, clearly the fund has delivered top quartile returns in 2012, 2013, 2014 and 2015 and 2016, so what have been the key drivers to those returns? SIMON EVAN-COOK: Well in any given year they can be different. But really what’s been behind a lot of the returns that we’ve had have been the returns from the underlying managers that we’re holding here. 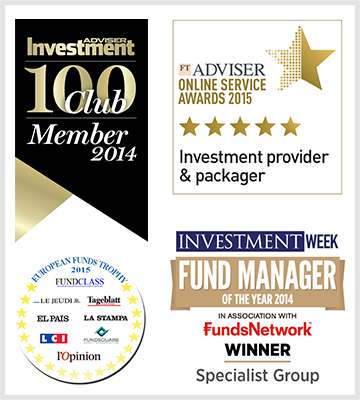 So we’ve had excellent returns from our fund managers. We tend to look for the guys who are very specific in the style that they’re operating, and therefore can outperform their markets by a very long way again after charges. So having a great selection of fund managers within that fund has been very useful for us. Again, having a focus just on being a growth return fund has helped as well. Because we’re not trying to be a Holy Grail fund that’s high growth when markets are rising and then tries to time markets when they’re falling and get into cash. We don’t do that in any of our funds. We certainly don’t do it in this fund. That’s helped us as well because we’re focusing on achieving that growth return on that total return. And so by staying in markets and staying focused on being in the best areas of markets we’ve actually achieved very good returns and quite consistently too. MIKE HAMMOND: So this is obviously a global equity mandate, but looking at the asset allocation there is quite a small exposure to the US which is unusual, why is that? SIMON EVAN-COOK: It is unusual you’re right. If you look at a global equity index, and therefore a tracker that follows that index, typically you’re seeing those being at least 50% US equities and in many cases more, I think probably up around 55%. So we’ve got a very heavy underweight compared to that, and certainly compared to a lot of other global equity funds out there. Now, there’s two reasons for that. The first one is that when we set this fund up we wanted it to be very diversified. Everything we do again across all the funds we run is about making sure our funds are very well diversified and therefore comfortable to hold for investors. With this fund, we were well aware that if we just mirrored what’s happening in the global equity index, you’ve got an awful lot of exposure there to US equities. Now that might make sense if you’re a US equity investor, but this is a UK fund, we’re a UK asset manager, and it’s for UK investors. It doesn’t make sense from our perspective to have all that exposure to one market, and all that exposure to dollars. So we set a neutral position of this fund in US equities of 15%. Now that’s useful in terms of knowing that you’re always going to be diversified, and you’re not going to have half of your assets invested in one market on the other side of the Atlantic. It’s actually quite useful for us as managers as well, because it means that we’re not constantly having to worry about whether we’re matching that in the index, and whether that’s going to hurt us or not. It leaves us free to go and find the best value across the globe, and that’s what we do. But in addition to that currently, and over the time we’ve been running this fund as well, US equities have always looked expensive, and never more so than they do today. And again being valuation driven investors, that’s meant we’ve looked elsewhere for returns, and what that means also is we’ve had very good returns from other markets because US equities over that time have actually performed very well. So the fact that we’ve managed to keep up with global equities over that time shows firstly that we’ve had very good returns from the fund managers where we have been invested, but also going forward if you are concerned about what US equities can achieve, this is a fund that hasn’t been reliant on that single engine to produce those returns in the past. MIKE HAMMOND: So looking at the asset allocation in a little bit more detail, you’ve got some exposure to alternatives and convertible bonds. What is it that the multi asset team are looking to achieve from those assets? SIMON EVAN-COOK: Well at any given time what we’re looking for is to look at the set of assets that are available, and find the ones where we think you get the best risk-reward trade-off. Now typically in this fund that’s going to be heavily equity focused. But what we want to do is again we want to keep volatility lower than you might get in a classic equity investment. But we don’t want to do that at the sacrifice of returns. So we’re looking for assets where we think we can match the returns from equities, but they won’t necessarily be correlated and moving in the same way as equities. So for us given where we are in the cycle currently where valuations, we wouldn’t say they’re expensive, they’re certainly not in a bubble, certainly not outside of the US anyway. But we do think returns are not going to be sky high from here. So that does mean that if you can find another asset class that will give you a return of 5, 6, 7%, that’s not linked to the fortunes of equity markets in the way that a classic long only equity fund would be, then it’s worth having. Now convertibles for us gives us an element of defensiveness, because they do tend to be more defensive than equities. If we’ve got a great fund manager there we get a level of alpha because they’re an efficient market. So that’s very useful for us. We also have some alternative strategies in there. These tend to be market neutral funds. So they’re not linked to what equity markets are doing. They’re just about the alpha of a fund manager, how good they are at picking stocks that they’re going to hold long, and avoiding stocks that they’re going to hold short. Now what they give us is an insurance policy if you like. Now if markets drop very steeply at any given time then the fact that these aren’t linked to that market means that we’ve got a pool of assets that haven’t dropped, which means that we can actually when the returns available from long only equities get higher and more attractive, we can switch into those. So they give us that insurance policy at the current time, which brings volatility down and gives us an option in the future to be able to use that to buy better returns should there be a correction. MIKE HAMMOND: So, given the current asset allocation that you’ve just been through in broad terms, what’s your current views on market conditions, and where do you see the opportunities and also the threats as well? SIMON EVAN-COOK: Well as the asset allocation suggests we see the opportunities really being anywhere but the US. If you like it’s an America last policy that we’re running here. So we have the ability to largely ignore US equities. We have some there where we’ve found pockets of value or growth. But really the opportunity is outside and away from US equities. And really anywhere else in the world offers reasonable value at the current time. There’s nowhere that’s screamingly cheap, but you take an area like emerging markets or Asia which have been under pressure for a few years, actually the valuations you’re getting there, and to a certain extent the growth opportunities there, are worth having certainly for a long-term investor. It’s not just emerging markets and Asia. You look at Japan, the valuations are good there, and we have some excellent managers who are able to winkle out the best growth opportunities or the best value opportunities. Or closer to home, UK as well, we like UK equities, we like the fact that the valuations have been left a little low following Brexit. We’re slightly contrarian in what we do. But Europe as well, they’ve been underperforming for a while now. But that’s left the value of a European equity considerably better than you’d get in the US. So it’s fairly broadly based, it’s just not in the US. So the opportunities are quite wide, and that’s where we’re focused on is the rest of the world ex-US. MIKE HAMMOND: So as part of the multi-asset team you run and manage a wide range of different mandates. So how does the investment process or the investment selection differ in this fund compared to the other funds within the range? SIMON EVAN-COOK: Well on one level it doesn’t differ at all, because we’re very disciplined in the way that we work. We have outcomes for each of our funds, and we’re focused on the outcome, and we use valuation to help us achieve that outcome. That is the same for the growth fund, it’s the same for the income funds, it’s the same for the conservative or absolute return funds. Now where that difference is is the outcome obviously of this fund is different. So that leads us to different areas, it leads us to assets which might have a higher volatility risk, but have a higher potential return as well. So that’s where the difference is. We’re still looking for the best fund managers, we’re still looking for undervalued assets, but really the difference is that we’re prepared to take more volatility risk, given that this is a long-term growth vehicle, than you might find perhaps in the conservative assets fund. Or in the income fund where really we need the fund or whatever the asset is to be yielding a certain level, we don’t have that yield requirement for the global growth fund, because it’s all about that total return and the income return is secondary. It doesn’t mean we don’t use income investments, we can do if we think that’s the best place to get a total return, but we don’t need to. MIKE HAMMOND: To summarise then, where would you see this fitting into a client portfolio? SIMON EVAN-COOK: Well you take me as a very good example of the classical holder of this fund. So I’ve just tripped into my 40s, unfortunately, and that means I’ve got 20, 25, maybe even 30 years before I retire. So my entire pension pot is in the global growth fund. Because I know that I’ve got time for that to invest, and it doesn’t matter if there’s a selloff in year six from here, which leaves the markets down 30%, because over time you’ll see that that recovers and you start to see those become blips with hindsight. So it’s for a long-term investor. It’s for someone who’s got capital that they’re not going to need tomorrow or in a year’s time that they need to grow. So be that because you’ve got spare capital that you don’t need to generate an income that’s going to form part of your inheritance, or whether it’s saving for your kids’ university fees, or it’s into your kids’ ISAs. It’s that type of long-term investment where you’re happy to put it away, leave it in the areas where you really are going to get the best returns over the long term, but at the same time you’re not concerned if the price of that falls or rises in the short term over that time period. MIKE HAMMOND: All that leaves me to do is to say thank you for your time today Simon. MIKE HAMMOND: Thank you. And I hope everybody found that fund update useful. Thank you.